Pets need dental care too! 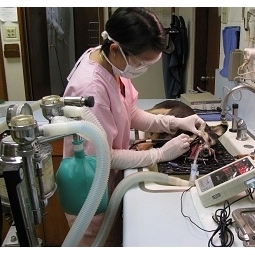 Complete dental exam is an important part of an annual physical exam at Animal Medical Clinic. Neglected teeth accumulate tartar, calculus and bacteria. If not treated properly, it can lead to gingivitis and periodontal disease. Dental disease is not only painful to your pet, but it can also lead to heart, kidney, and liver disease. Animal Medical Clinic offers routine scaling of teeth, teeth extractions and complete home dental care. What is dental cleaning for pets and why is general anesthesia necessary? Dental cleaning is the scaling and polishing of your pets teeth to remove dental plaque and tarter buildup. Not only does dental cleaning remove the visible tarter and plaque, it also takes care of the bacteria under the gums. Which helps eliminate infection, oral pain and tooth loss for your pet. To do a through and deep teeth cleaning the patient must be under general anesthesia allowing your pet to be pain free and allowing the veterinarian to fully inspect the teeth. What are the benefits of pet dental? The most obvious and apparent change will be your pets fresh breath. But the long term benefits are much more important which include having health gums and the prevention of periodontal disease. Not only are we saving your pets teeth but we are also able to protect their internal organs which may be affected by the bacteria from the gums if it enters the bloodstream. Periodontal disease begins with the build up of plaque a combination of bacteria and bits of food. Then the minerals within your dogs saliva creates a bond with the plaque to form tarter which sticks to your pets teeth. Allowing bacteria to make their way under the gums causing gingivitis which then leads to the tissue around the tooth to be damaged causing tooth loss. How can I keep my pet's teeth health? After the dental cleaning has been performed annual dental cleaning and dental products will help keep your pet's teeth health. We have products that we recommend for plaque prevention which helps break down plaque build up on the surface of your pets teeth. Daily brushing also helps by removing bits of food in your pets mouth but don't use any human toothpaste which may contain dangerous ingredients. Out vet clinic provides special toothpaste which is available in multiple flavors just ask us on your next visit.